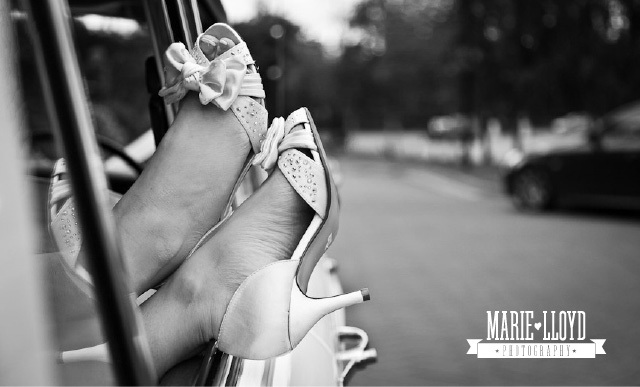 Marie and husband Jason got in touch shortly after Swash and Fold opened its doors to the world, looking for a helping hand with the online side of their Wedding Photography business. Additionally, Marie wanted to build a stronger brand identity, with an updated logo and look-and-feel that better reflected their target market. Two sites are way more time-consuming to keep up-to-date than one. Two different URLs meant visitors were forever hopping between sites. As you can see above, Marie’s logo was perfectly functional. But it lacked character, and didn’t really reflect the personality of the business. The design of the websites suffered from the same symptoms… they did the job fine, but without a strong logo to hang a design around, the page layout was a little on the flat side. 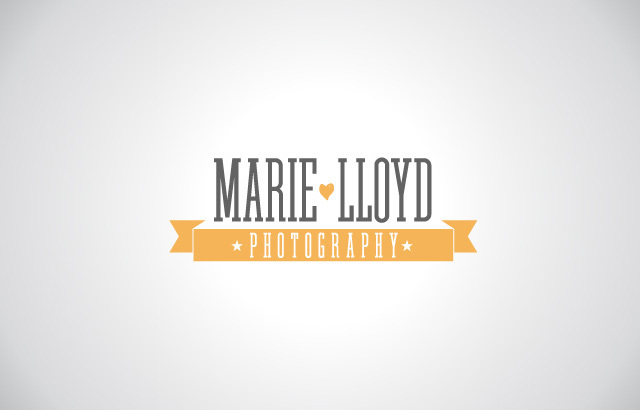 Marie had some ideas on the sort of logo and style she liked, and the sort of thing she wanted to represent the business. The problem always is being able to communicate those ideas – design and taste are notoriously hard to explain in words alone… what we needed instead was some way of visually exploring those ideas. 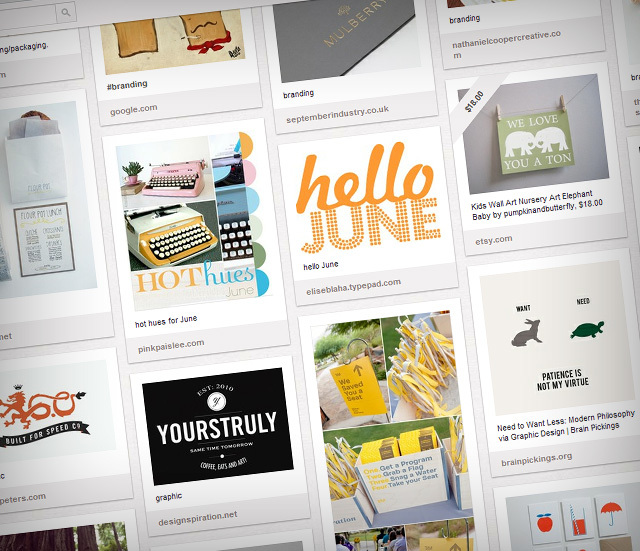 I got Marie to set up a board on Pinterest to reflect her design taste, and told her to get pinning! Pinterest is perfect for things like this. The more pins Marie added, the more her taste and visual preferences started to become apparent. Looking through the board it was possible to identify common elements across the range of pins, and colours, typography and a general design style gradually revealed themselves. With design approved and Marie happily off re-badging her Facebook page, we turned our attentions to the web side of things. We’d already worked out a new sitemap, putting the important information front and centre for visitors, and tucking supporting pages out of the way until they were needed. The guys were already familiar with WordPress so it made sense to stick with this, especially as the blog would continue to play a key role in the site. For WordPress, I prefer to start with a blank canvas like Starkers, by Elliot Jay Stocks. 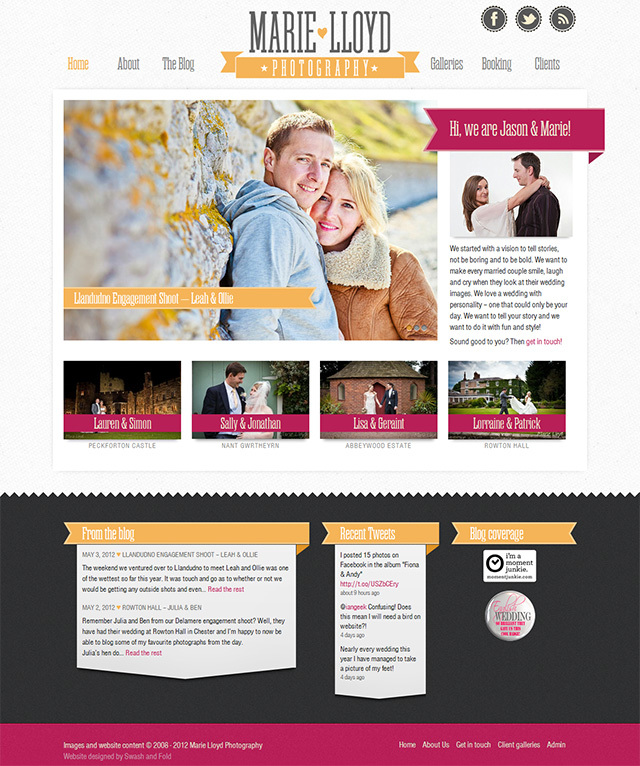 Its basically a version of the default WordPress theme, minus any kind of formatting whatsoever. This means we then have a solid starting point, but can still stamp it with its own personality. And personality is the key thing here… there’s an old business adage that says “people buy people”, and its no less true in an industry like Wedding Photography. So it was important to make sure Marie and Jason’s personality came across. 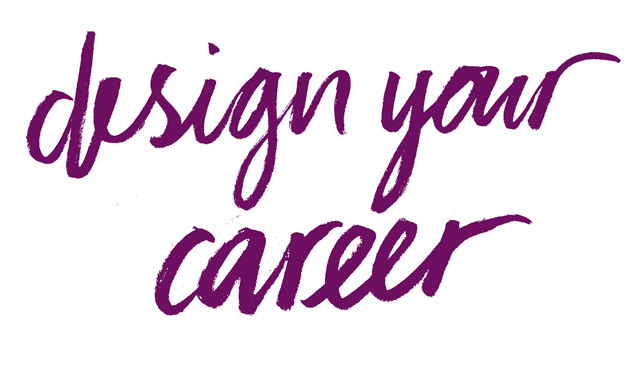 As a result, the tone of both the design and content needed to be friendly, fun, upbeat and approachable. Exactly like the guys! The overall design reflected the logo closely, introducing a second contrasting colour, echoing the folded “ribbon” elements in headings, and discrete use of web-fonts to tie the whole thing together. The font used in the logo (“Kenotaph”) proved a little too elongated for general use in headings, but a medium weight slab from the very similar “Rama” family was happy medium. Style is all well and good, but counts for little if the content isn’t there, so I wanted things to be as simple as possible for the guys to be able to update, particularly the homepage. To this end, I made a custom script in WordPress that automagically updates the main slide banner and the four featured posts using post categories. 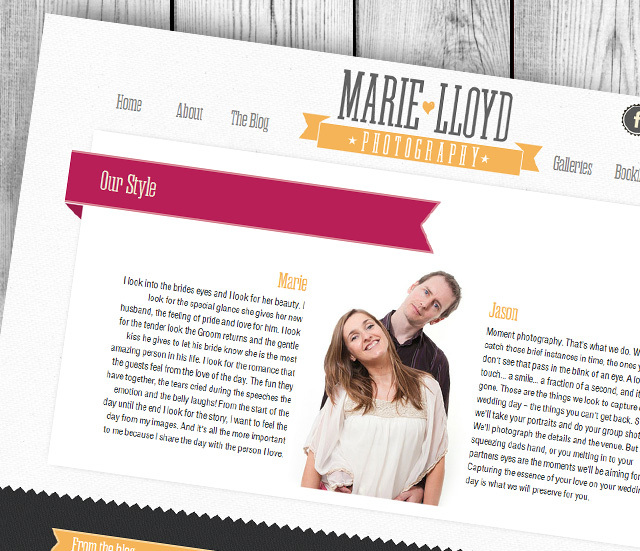 I also made sure the code was as easy as possible to work with, making things like two-column layouts a doddle! 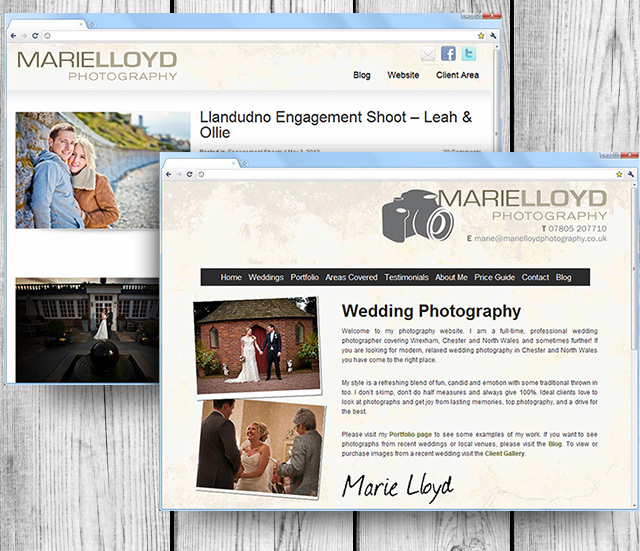 The site is up and live right now at www.marielloydphotography.co.uk, so why not swing by and take a look? And give Marie a shout on the Twitters while you’re at it – I’m sure she’d love to know what you think!